As the UFC embarks on a record-setting week, where the planet’s premier mixed martial arts organization will be hosting three events in consecutive nights, the company could sure use some good fortune following Ronda Rousey’s shocking upset loss last month to Holly Holm. With the UFC’s biggest and brightest superstar brought back down to earth with a highlight reel head kick, three fighters the UFC has put the marketing machine behind need to pull through to pick up Rousey’s leftovers. Paige VanZant and Sage Northcutt are young, up-and-comers who the UFC believe can be future studs. VanZant headlines Friday’s UFC Fight Night 80 against Rose Namajunas. Northcutt opens for her when he meets Cody Pfister earlier that evening. VanZant has only seven pro MMA fights under her belt, with the last three coming in the UFC. However, no doubt with the UFC’s assistance, the bubbly 21-year-old managed to score a Reebok sponsorship before many of the UFC’s current champions. Northcutt is still two years shy of legal drinking age, but he has plenty to celebrate having finished off all six of his opponents before the final bell. The UFC has been pushing “Super” super hard on social media, forwarding several of Northcutt’s video posts to their nearly-21 million Twitter and Facebook followers. The UFC hardly ever does that, let alone multiple times for the same fighter. The UFC has clearly bought in early on VanZant and Northcutt’s stock, and they’re hoping it pays big dividends down the road. Bad losses here for either – God forbid, both – would derail their hype trains and set their young careers back years. But having PVZ and Northcutt lose would just be the tip of the OMG iceberg. With Rousey down and out for the foreseeable future, it can be argued that UFC interim featherweight champion Conor McGregor (pictured) is the UFC’s biggest star today. McGregor has essentially been a draw since he joined the UFC six fights ago in 2013. Love him or hate him, there’s no denying there’s something special about “Notorious.” Whether it’s his gift of gab, charisma, devastation in the cage, he puts butts in seats and pulls eyeballs to TV screens. White has been accused of favoring McGregor in the past, something he hasn’t necessarily denied. McGregor appears to be White’s second-biggest cash cow, and the UFC is planning on milking the Irishman for all he’s worth. 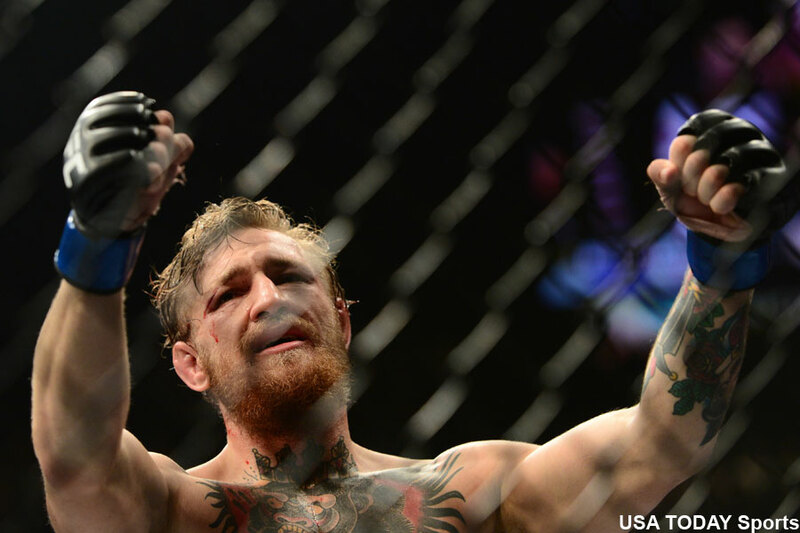 McGregor looks to unify the featherweight title Saturday against champion Jose Aldo. It’s the most anticipated 145-pound fight in MMA history. White has stated the sold-out show will pull over a $9 million gate at the MGM Grand Garden Arena in Las Vegas. UFC 194 is also expected to be one of the company’s most successful pay-per-views ever. McGregor’s star will certainly skyrocket if he’s able to hand Aldo his first defeat in a decade. But what if McGregor loses? Clearly, having McGregor fall would be the worse of the three evils for the UFC. They’d gladly trade a pair of VanZant and Northcutt losses for a victorious McGregor all day, any day. VanZant and Northcutt signify the future, while McGregor represents the present. The UFC desperately needs all three to shine this weekend now that Rousey’s star isn’t blinging nearly as brightly.